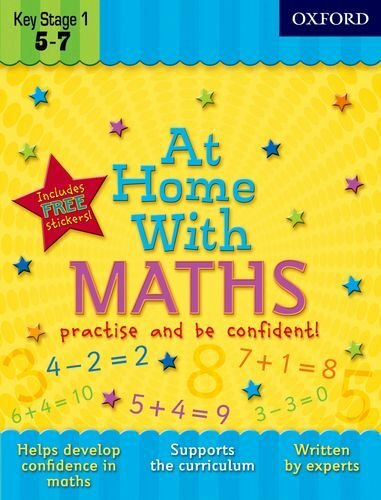 At Home With Maths is a fun activity workbook for children, aged 5-7 years, to do at home. Each double page is devoted to a different maths topic and, using a variety of tasks such as drawing, tracing, filling in missing numbers, children will learn about patterns, shapes, adding, subtracting, measuring, money, diagrams, and time. Each page is divided into a Warm Up task devoted to number work, a Learn About task to teach a particular concept, and Now Try These tasks to give a practical application. The colour illustrated step-by-step activities are simple enough for children to work through on their own, or equally perfect to do together with an adult giving encouragement. Useful tips support adults so that they can encourage learning gently - plus there are more than enough funky stickers to reward your child as they complete each double page spread! This book is ideal to build confidence in maths at primary school.